Given two points, and (the foci), an ellipse is the locus of points such that the sum of the distances from to and to is a constant. 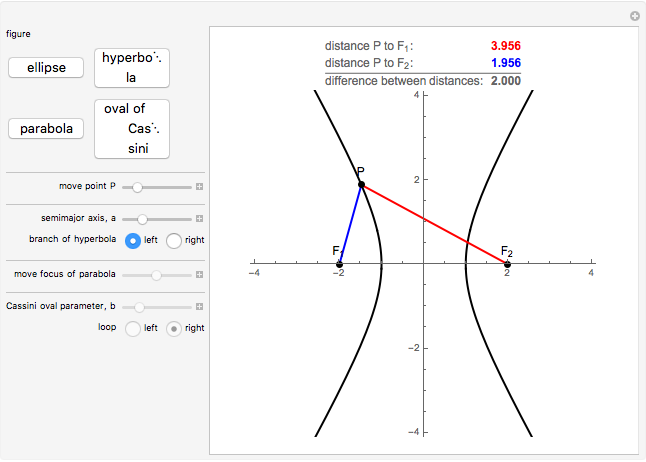 A hyperbola is the locus of points such that the absolute value of the difference between the distances from to and to is a constant. An oval of Cassini is the locus of points such that the product of the distances from to and to is a constant ( here). A parabola is the locus of points such that the distance from to a point (the focus) is equal to the distance from to a line (the directrix). This Demonstration illustrates those definitions by letting you move a point along the figure and watch the relevant distances change. 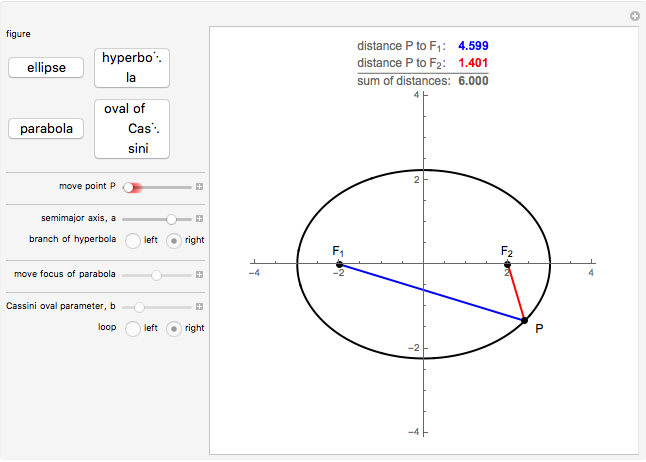 If the sum of the distances from a point on an ellipse to the two foci is , then is the semimajor axis of the ellipse. 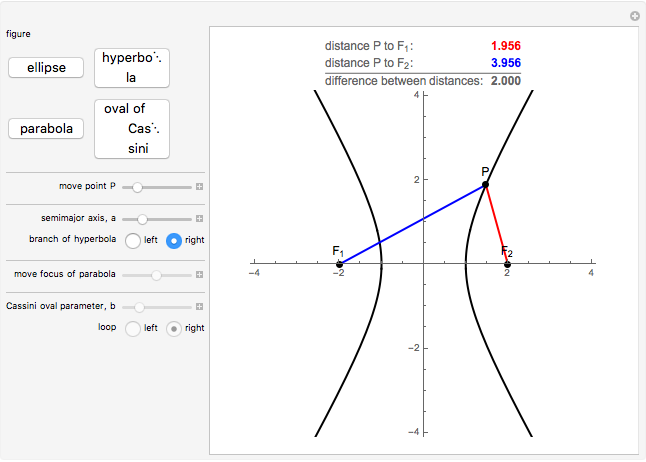 If the absolute value of the difference between the distances from a point on a hyperbola to the two foci is , then is the semimajor axis of the hyperbola. For ellipses and hyperbolas oriented as here, the semimajor axis of either is the distance from the origin to an intercept of the figure. For the ovals of Cassini, if the constant is equal to , where the distance between the two foci is , the figure is a lemniscate. When , the curve consists of two disjoint "lobes" (see snapshots 4 throrugh 6). Marc Brodie "Locus of Points Definition of an Ellipse, Hyperbola, Parabola, and Oval of Cassini"